Hi friend! I hope you’ve had a fabulous week! 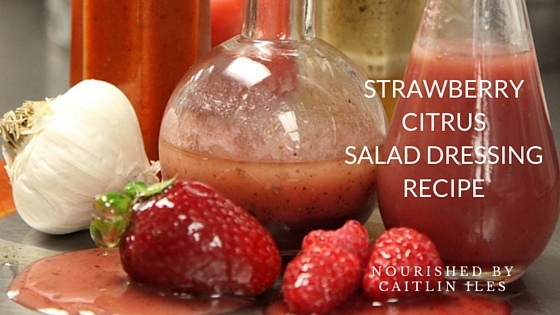 Today we’re going to be making a delicious, fresh and fruity nourishing springtime vinaigrette using some of my very favourite ingredients. Honestly, this recipe is the first time I’ve actually used hemp oil in anything and I was pleasantly surprised with the nutty flavour and the vibrant colour! I expected a more clear, somewhat tasteless oil, but it is a rich green and jam packed full of flavour and nutrients making it the perfect oil for our dressing today. I picked up this organic, cold pressed hemp oil from Costco for under $10! Quite the steal of a deal, so definitely look for it next time you’re there! Anyhoo, on to the good stuff. hat being said, strawberries are like a magical fruit because when eaten in a serving of about 1 cup (150g) they actually help prevent blood sugar spikes! Researchers believe it’s the polyphenols (a type of antioxidant) that are responsible for this effect. So eating strawberries in conjunction with a sugary meal can help stabilize your blood sugar. Not too shabby! Is there any food that is more associated with Vitamin C than the humble, delicious orange? Vitamin C is crucial for building healthy skin, functions as a fantastic antioxidant in the body, and is necessary for regulating the immune system. This vitamin is known as a water-soluble antioxidant, which disarms free radicals and prevents damage in the aqueous environment both inside and outside cells. Mitigating this damage is a crucial component in preventing DNA mutations within the cell. Consuming the juice or meat of an orange is more beneficial than consuming vitamin C or antioxidants on their own because oranges are also chock-full of other antioxidant phytonutrients that work synergistically to provide a one-two punch of cellular protection. This oil is great to use in salad dressings or other cold preparations because it’s rich in omega-3 and omega-6 oils. It has a ratio of about 1:3 in terms of 3:6, so as long as you have an otherwise healthy balance of these fats in your diet there should be no issue incorporating healthy amounts of hemp oil in your diet. That means you already avoid vegetable oils (check out these posts for more info on healthy fats and oils Part 1, Part 2, Part 3) and consume cold-water fish, and small amounts of nuts and seeds. Having the proper ratio of omega-3 to omega-6 is crucial for regulating the inflammatory pathways in the body and preventing chronic inflammation. Incorporating healthy sources of omega-3 fats into your diet, such as hemp oil, is a great way to help regulate our immune system, build healthy cells, and prevent chronic inflammation and illness. 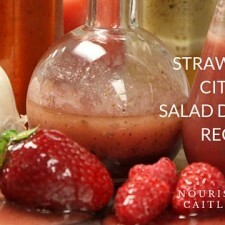 Alrighty, enough of the technical stuff, here’s how we turn these ingredients into a delicious dressing! This light, fresh dressing is sweet, tangy, and savoury which makes it the perfect accompaniment to any summer salad on the menu! Add strawberries, orange zest, & juice, balsamic, apple cider vinegar, sweetener, garlic, Dijon, and sea salt to a blender or glass bowl. Blend until smooth using an immersion or stand up blender. Once smooth, slowly drizzle in oil while blending. Refrigerate overnight for best flavour. Can be stored for 5-7 days. Well that’s the recipe for the day friend! Have a wonderfully whimsical weekend!